I'm now living about an hour from Montreal, and so Eddy and I decided to take advantage of our locale and visit Montreal for an evening during Nuit Blanche. Truth told, we only discovered it was Nuit Blanche after reading this article about sandwiches to eat in Montreal, and trying to decide what weekend we'd head out to see how the list holds up. While trying to choose a weekend to book a hotel, I noticed that there was a 24 hour showing of The Clock, one of my favourite works of art. (I blogged about seeing it in Ottawa here.) So it worked out that we could eat a lot of sandwiches, and catch a showing of the Clock for free as part of Nuit Blanche, which seemed like a perfect plan. We started out hungry on Saturday morning, aiming to eat at Patati Patata. This was slightly misguided because there was snow and the drive took closer to 2 hours, and by the time we arrived it was noon and the lineup in this tiny place was almost out the door. If I'd had a light breakfast, or had anything other than black coffee at this point I might have been able to endure waiting in line to get a seat. But that wasn't the case. So we walked for a while and found Cafe Code Black. It sure looked nice inside, with reclaimed furniture and minimal decor, and the coffee was served quickly and was of great quality. That said, we waited at least 30 minutes for our sandwiches, and they were a bit disappointing, especially since they were around $10. After leaving Code Black we started to walk back to the car to head to the hotel. We walked past Patisserie Nôtre Maison, a small Portuguese bakery. We went in, mostly because I was excited about fresh donuts, and we ended up splitting another sandwich there as well. (The donut was all mine.) This sandwich didn't have any fancy name, you just picked a meat and cheese and they put it on a fresh roll with lettuce and tomato...but it far outshone the previous sandwich, and was less than half the price. An important lesson here is that fancy coffee shops are good at coffee...but tiny independent bakeries that don't look cool at all are probably better at sandwiches. After checking into the hotel, we found our room overlooking Place des Arts, where all the excitement was happening. Jugglers were warming up and the ferris wheel was already spinning. We found out that we could go from our hotel to the art gallery through an underground path without ever going outside, which seemed great, since we knew we would be waiting in lineups later on and not having a heavy winter coat would be a blessing. 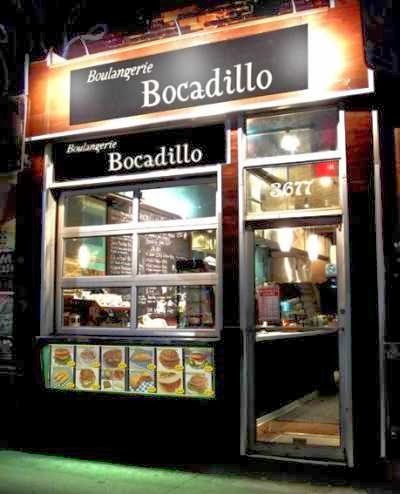 After relaxing for a while, we headed back out on foot to explore Rue St. Catherine for some window shopping, and a barber shop stop for Eddy, and then found our next planned sandwich shop, Bocadillo. Bocadillo was a total success. We ordered a passion fruit pulled pork arepa, some fries with spicy dipping sauce, and a couple of empanadas. This meal was a highlight and I would definitely recommend this restaurant. We will go back another time. Luckily, we noticed that the restaurant was near Ye Olde Orchard pub, so we stopped in there to have a pint or two of St. Ambroise. Next on our walking tour was Benelux, a craft beer bar. We could have easily stayed there all night sampling beers, but after a flight it was nearing 10pm and our plan was to try to catch The Clock at midnight, so we headed back to the hotel to drop our coats and head to the Musée. Like many events with thousands of attendees and loads of security, things were a little sticky getting into the museum, and we were forced to go above ground and outside (in spite of the supposed no-need-to-go-outside advice we'd received) to climb a ridiculous flight of wooden stairs, then descend another flight of slippery stairs, to get to the entrance. 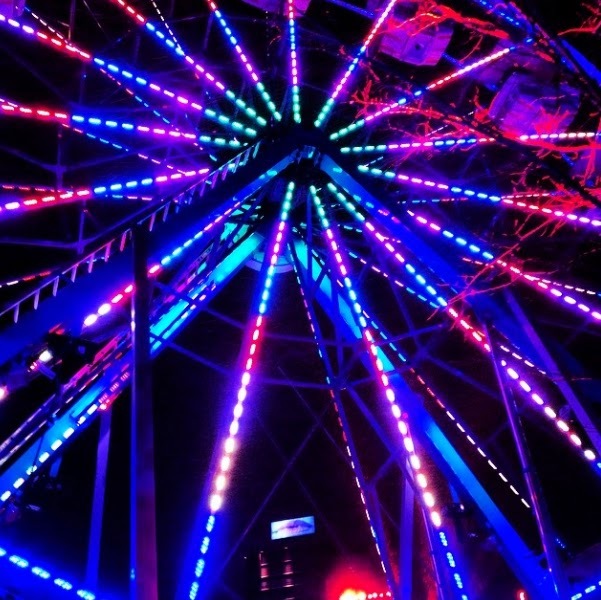 Note to Montreal Nuit Blanche: this would be hard to do in a wheelchair. Once inside, we began lining up for The Clock. The museum was packed with impatient people all wanting a look at the art piece, rarely able to be viewed past regular museum hours. It seems that other people had the brilliant idea of catching the midnight hour, because after lining up for nearly two hours we found ourselves frustratingly close to the entrance at 11:45pm. I suggested anyone in there at that time was staying for midnight, and I was right. The venue virtually cleared and we were allowed in and found seats at 12:09am. Alas, it was still a fun experience to see the film from almost midnight until after 2am. A lot of the piece at that time revolves around people in bed and people waking up or going to sleep, and I started to get drowsy, so we headed out of the museum. We took a quick walk through A Matter of Abstraction on the way out and I was excited to see some works from William Ronald. I guess those years at the RMG rubbed off on me because I feel like I could spot his work from a mile away. By this point it was a complete blizzard! After being forced outside again, and suffering our way back to the hotel (maybe the not bringing coats thing wasn't a great idea) we bundled up and headed to find some late night munchies. A massively disastrous service experience at Frites Alors! led to a stop in at Five Guys burgers. It was just as you'd expect it to be at 3am -- better than McDonalds. Sunday morning we had a solid breakfast at Eggspectation, and headed out for a nice sunny walk through downtown Montreal in search of plaid shirts. After some success, and a drool-worthy stop in at one of my favorite Montreal shopping spots Simon's, we went to the movies and saw Monuments Men. It disappointed but I still enjoyed some of the art references and historical basis. I'd like to read the book, and it gave us lots to talk about on the drive home. All in all attempting to eat 10 sandwiches in two days was a bit of a bust. On the upside, we are close enough to go back soon and make another attempt!